I caught up with Jean Lapierre, Liberal MP from Outremont and chatted with him about the convention and the nation resolution. OTTAWA, Nov. 27 /CNW/ – Canadian stars including Wendy Crewson, Sonja Smits, Fiona Reid, and R.H. Thomson spoke out today about the Canadian TV drama crisis during the first day of CRTC public hearings. ACTRA has been sounding the alarm about the crisis in Canadian television drama for years, and demands that the CRTC fix its disastrous 1999 Television Policy. The CRTC commenced its review of the regulatory framework for Canadian over-the-air television on November 27, 2006. ACTRA formally presents before the CRTC on December 4, 2006. Stakeholders of the state complaining about their stake? No news here. However, to say that our very culture is at stake? Canadians indeed have a culture of frontier survival, competition and innovation don’t we? Wouldn’t a freer market not only improve Canadian television, but maybe also help me identify names listed as “Canadian stars”? This reminds me of daycare unions claiming that their interests in the childcare funding debate are founded primarily in “the children” instead of their own benefit. Government stakeholders will always decry the optimization of services and label it a threat to either children, sunshine or Canadian culture. CP published an article yesterday that quotes Garth Turner’s recollection of a debate he had with Charles McVety of the Family Action Coalition. McVety also expressed surprise that a respected journalist and news service would see fit to publish quotes attributed to him without verifying their authenticity. I can understand that any good person would want to clear up false information about events surrounding themselves and their acquaintances whenever possible. Yet… Garth’s alleged falsehood isn’t exactly bad press for McVety. If I was a lobbyist, policy advocate, or political constituency representative, if some media magnet was going around and telling the press that I had the Prime Minister on speed-dial and could get our country’s leader on the phone in two minutes, clearing that up wouldn’t be exactly be on top of my list of priorities. You think he’d wait at least until the weekend was over, or that he might write a letter to the editor. But no, McVety sent out an urgent press release ($) late last night, just hours after that damaging story was published in order to clear up the horrible (horrible!) “fabrication”. Wow, that would be impressive. If true, it would show that McVety has a lot of influence and this isn’t exactly damaging to his job function. McVety should probably straighten out Garth’s “fabrication” if untrue, but he might wait until, oh say, someone cared enough to ask him if those rumours are true. Why go so far as to spend cash to clear this up? Why is McVety so eager to clear the air? So today, on an imminent challenge from the Bloc Quebecois, the Conservative government tabled a motion today that defined Quebec as a nation within Canada but one that would never been independent of it. Predictably, western conservatives are upset with their adopted son who now governs from Ottawa. Predictably, Gilles Duceppe is upset with the rug that’s been pulled out from beneath his feet. Stephen Harper has been playing with the notion of Quebec nation since at least the time that his caucus met at the Citadelle in Quebec City. Some say the Bloc forced federalists into this resolution, however there are political factors to consider as well. First, this puts Harper’s preferred Liberal candidate Michael Ignatieff in a good position. Ignatieff will get some credit for being the Liberal leadership contender to “initiate” this latest round of discussing Quebec’s nation status. This also bodes well for Stephane Dion who could split the delegates firmly into his camp if he chooses to continue to adamantly defend his position that Quebec is indeed not a nation (at least constitutionally), not within Canada, not independent. Ignatieff of course wanted to define Quebec as such in a constitutional sense. The Prime Minister (and the HoC’s) declaration of Quebec as a nation is merely a sociological distinction. Has the Prime Minister, in essence, shifted the Liberal leadership race off the axis of Ignatieff-Rae to Ignatieff-Dion? And in doing so, has Harper forced the Liberals to pick his preferred candidate? Does Harper’s play today also appeal to the true notion of asymmetrical federalism? Will we see a western nation, a northern nation? Does this also play into a model of reform for the Senate of Canada, a model which would emphasize regional and cultural minorities (such as Quebec)? This track of reform has been discussed for over 100 years. Constitutional measures are not supposed to be taken on a whim so does this fall into a pre-planned larger redefinition of the Canadian dominion? Then again, this doesn’t appear to be Ignatieff-envisioned constitutional measure, but merely a sociological distinction to recognize the Quebec people as a people. The question remains… does this have constitutional repercussions for Canada, or is it a subtle position that means nothing of the sort but appeases the desire for some in Quebec to be recognized if only as a concept? If Harper were to form a majority government, his planned legacy may be to put Canada’s constitutional house in order. But, if this is merely a sociological distinction, is today’s news non-consequential to any type of reform? This, of course, raises many questions for debate in the future. Many of which are unanswered at this early stage. UPDATE: No news release yet from the Ignatieff camp on today’s news. Is he refining his position again? UPDATE: After watching a few more press conferences, I’m starting to rethink Dion’s chances here. This will take a huge bite out of Dion if the Liberal caucus buys this nation business wholesale. One thing’s for sure, Dion is up tonight thinking about how next week can unfold. Will Dion fight the nation resolution or could he even drop out of the leadership race as early as tomorrow? How on Earth can he run to lead a party that will wholeheartedly support this motion? Harper’s proposal also won the approval of Stephane Dion, the lone Quebec contender who has fiercely criticized the Liberal approach on the issue. He said Harper’s motion is “very close” to a compromise he’s been floating among Liberal leadership candidates. Looks like Dion’s still going to fight on. He’ll certainly lose delegate support on this though. Warren Kinsella also looks at the man that now finds himself tied in a knot. Posted on November 22, 2006 Author Stephen TaylorCategories OtherTags bloc quebecois, gilles duceppe, liberal leadership race, michael ignatieff, quebec as a nation, stephane dion, stephen harper, warren kinsellaLeave a comment on Quebec a nation? Much ink has been spilled on the “fossil of the day” award which was given to Conservative environment minister Rona Ambrose at this year’s U.N. Framework Convention on Climate Change (UNFCCC). Activists complain that the Canadian government deserved the dubious distinction for its inaction on addressing greenhouse gases. Let me make a graph too! Both ministers of the environment “earned” the award. Why is the media only interested in the one that slags the Conservatives? Consider too that Dion won the award (in 2004) during the last federal election (a time when the smallest political news becomes a amplified for consumption by the electorate). Remember too that Paul Martin’s campaign plane was less environmentally friendly than Stephen Harper’s. Dion claimed victory over a 30% increase in greenhouse gas emissions since 1990 and banged that gavel (gavel banging must be Dion’s favourite talking point). Now Dion makes the virtually the same 2050 GHG reduction projection as the Conservative government’s Clean Air Act. Why is it that after 13 years of inaction on the environment, after producing the lion’s share of a 30% increase in GHGs since 1990, and after failing to act on reducing environmental pollutants do the Liberals get a pass in the media? This while Ambrose receives the same dubious distinction for the Liberal record. This while the Conservatives propose a real plan for reduction of environmental pollutants (and the same pie-in-the-sky 2050 GHG reduction projections as Dion). The media should look at the facts surrounding the Conservative and Liberal records on environmental issues and not rely on their preconceived biases. While Liberals and the Conservatives may be equally sexist, the Conservatives get the media attention because of preconceived bias. 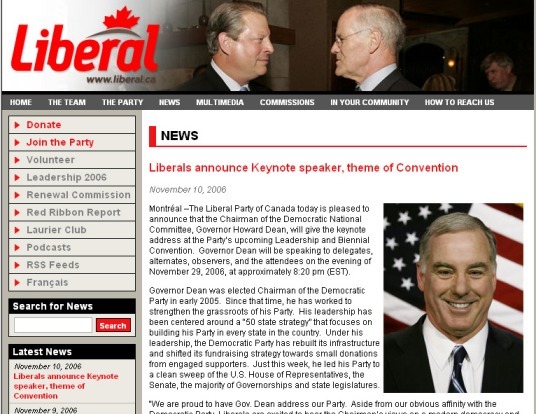 UPDATE: The link to the environmental activist website above contains an anecdotal account of the 2005 climate conference and seems to be in conflict with other information. While the “fossil of the day” awards website is still not fully-functional and does not currently list previous winners of the awards, reader Nbob has pointed me to another website which contains the proceedings of the Climate Action Network, the activist group that hands out the “awards”. According to Climate Action Network press releases from the Montreal UNFCCC of 2005, Canada did not receive a “fossil of the day” award that year. However, digging deeper, Liberal environmental Minister Dion did receive a “fossil of the day” award from the UNFCCC in Buenos Aires in 2004. (News stories written about this by the Canadian MSM: 0). Those are the numbers for the Climate Change conferences from 2001-2006. Four MSM news articles for six “fossil of the day” awards given to Liberal governments. This is compared to the 193 articles written up about the Conservative government receiving two of these awards! My deep news search application only goes back to Jan 1, 2001. However, proceedings of the 2000 conference detail that Canada won the “fossil of the day” award more times than any other nation at the UNFCCC in The Hague. 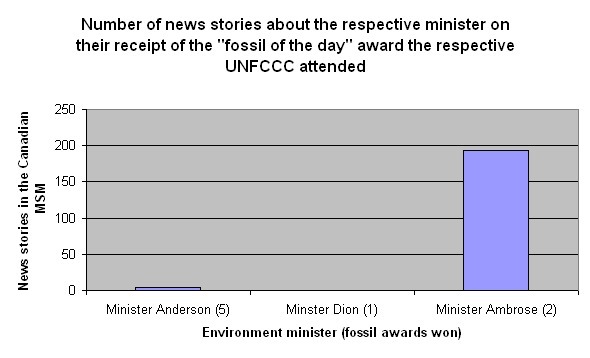 Here’s a new graph showing the “fossil of the day” awards won by each minister, and the number of MSM news stories that results from those wins (since and including UNFCCC in 2001). Now, when you hear that the Liberals try and claim that they’re champions of the environment and when you hear that the Conservative plan is a bunch of hot air, please consider this data not provided in those 193 news stories. 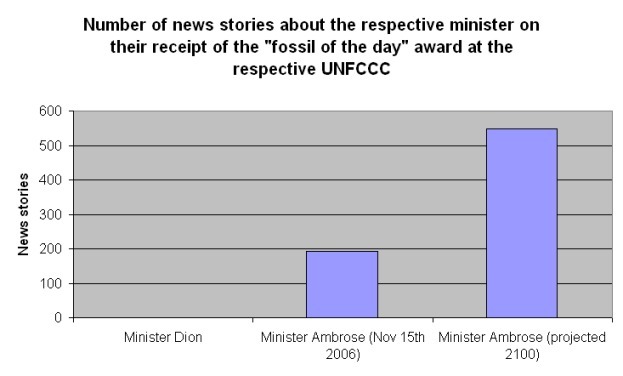 Ambrose was not the first Canadian environment minister to win the “fossil of the day” award. But, reading the MSM, you’d be led to believe that she was. The Liberals have a trophy case full of “fossil of the day” awards. Is this an example of media bias?